What Beanstalk Triggers and Actions are Supported? New Comment - Triggers when you add a new comment. New Changeset - Triggers when a new changeset occurs. New Public Key - Triggers when a new public key is added. New User - Triggers when you add a new user. New Repository - Triggers when you add a new repository. New Invitation - Triggers when you add a new invitation. Release - Triggers when a new release occurs. New Server Environment - Triggers when you add a new Server Environment. New Release Server - Triggers when you add a new Release Server. Send an Invitation - Sends a new invitation. 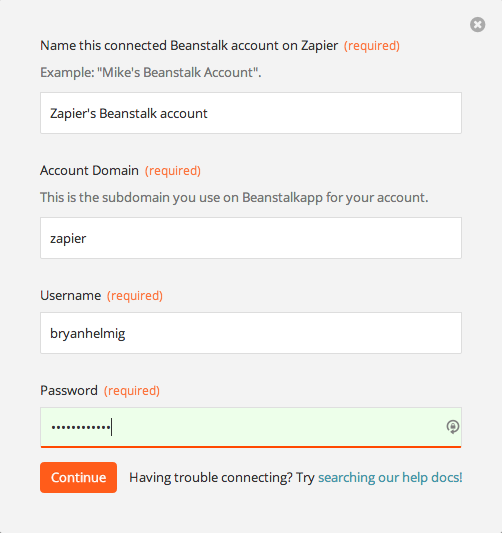 To get started with Beanstalk, first click to add a Beanstalk account to Zapier to be used in your zap. Next, you'll be asked for your Beanstalk account domain, username, and password. To find your account URL, you'll want to log into your account and click on "Account" near the top-right of the page. Once you've entered your credentials and clicked continue, we'll test your account to make sure the connection works. If it does, you're all set! A fast and secure way to handle a team's code, Beanstalk supports SVN and Git.